The orangutan (Pongo pygmaeus) is a highly-developed primate that is very strongly linked to people. Not unlike many human females, orangutan mothers tend to develop lasting connections with their offspring -- ones that last for years. 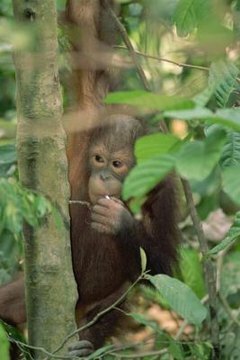 Orangutan mothers are usually a little more companionable than the males of their species, as the males tend to heavily favor seclusion in lifestyle. "Junior" orangutans typically live alongside their mothers until the approximate age of 8, according to the San Diego Zoo. In some cases, they stay with mom for even longer than that. This is due to the overall solitary nature of orangutans as a species in both genders, but especially in males. Once orangutans are on their own, they're really on their own, which is why it's so important for them to soak in all of the information they possibly can from observing their mothers. In order to stay alive and thrive, wee orangutans have to absorb a lot of details, including nesting techniques and foraging for food. Although offspring of both genders remain with their mothers for years, young female orangutans usually stay around longer than males, indicates SeaWorld. Female offspring also frequently assist their mothers in caring for any newer siblings, if they exist. When the young ones do "move away" from mommy, the boys tend to travel greater distances in order to establish long-term home bases, as well. Female orangutans generally opt to stay nearby. In the orangutan world, nursing is quite a long-term process. Mothers start nursing their little ones immediately after birth and conducting initial cleaning procedures. Weaning generally begins when offspring are between 3 and 4 years old. However, orangutan mothers may still occasionally nurse their youngsters up until approximately 7 years of age, according to Primate Info Net of the University of Wisconsin at Madison. This later nursing is especially common in young ones that are experiencing anxiety, for example. In the wild, orangutan fathers do not assist the mothers in raising their wee youngsters. The responsibilities of rearing the little ones are solely for the mothers. When it comes to social behaviors, male orangutans do not partake in much beyond the actual physical mating process. How Do Rhesus Monkeys Raise Their Young?